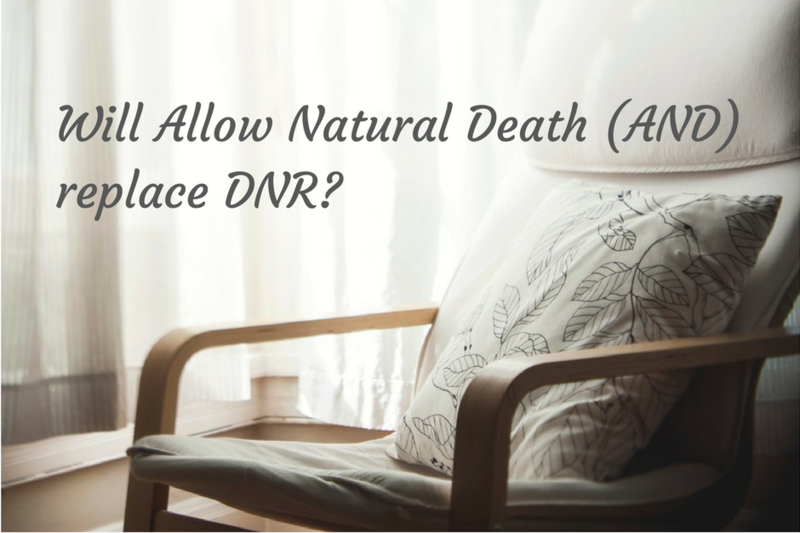 Home Health News Will Allow Natural Death (AND) Replace DNR? DNR or “Do Not Resuscitate” is the predominant and customary medical order in the United States. It has been put into law and adapted by many health care organizations. A DNR gives patients a choice that when the heart stops beating for any reason, physicians are instructed not to attempt to resuscitate you or provide advanced cardiac life support. In the absence of a valid physician’s order to forgo CPR, if a patient experiences cardiac or respiratory arrest, the standard of care is to attempt CPR. Paramedics responding to an arrest are required to administer CPR. However, some patients will decide against CPR if given the choice and for medical reasons. 1. Resuscitation is not always painless. While television shows and movies have conditioned many of us to believe that receiving CPR is painless and is always successful at bringing persons to life in their normal disposition, this is not always the case. 2. CPR is not a cure for illness or medical conditions. Did you know that if your heart stops, every 1 minute means a 10% decrease in survival? Under certain circumstances, CPR may not offer the patient direct clinical benefit. This is because resuscitation will not be successful or because surviving the resuscitation will lead to co-morbidities. This means that resuscitation will merely prolong the patient’s suffering. 3. Low survival rate for critically ill patients. Studies show that for seriously ill patients who are revived, 15-20% leave hospital alive and only 5-10% will survive for 1 year. 4. CPR is a procedure that also involves risks. It is important that CPR must be considered for what it is, a procedure similar to surgery that involves applying pressure to the chest, deep enough to reach the heart to help move oxygen to vital organs, electrical shocks to the chest, intubation, and IV medication; and therefore expose patients to certain risks. 5. CPR is a high risk procedure for older patients. According to this study, for older patients and those with chronic, serious, and terminal illness, the chances of surviving CPR are less and exposure to risks are considerably higher. In 2005, the American Heart Association moved from the traditional do not resuscitate (DNR) terminology to do not attempt resuscitation (DNAR). DNAR reduces the implication that resuscitation is likely and creates a better emotional environment to explain what the order means. The struggle with DNR terminology is the misconception that Do Not Resuscitate implies receiving substandard medical care. Whereas, DNR means that after a patient dies, no aggressive measures like CPR would be performed. A patient would then be allowed to die peacefully and naturally. Allow natural death (AND) is an emerging term that is being recommended in some settings to make the meaning even clearer and a formal designation that can replace the DNR order in hospitals and other health care facilities. According to the Journal of Medical Ethics, those who propose to replace DNR with AND suggest that DNR orders are ambiguous and require complex understanding between several parties, while AND orders are clearer. Organizations such as The Hospice Patients Alliance have started to support the creation of this new end of life care designation. AND supporters hope to increase the number of terminally ill patients who are allowed a death with dignity. This takes into consideration the top priorities of patients with terminal illness that include avoiding suffering and unnecessary medical expense, being with loved ones, remaining mentally alert, and not becoming a burden to others. If you are thinking which term to use between DNR or AND, especially on your medical ID bracelet – most hospitals still use DNR as a convention. Which of these terminologies (DNR, DNAR, or AND) should be adapted by the health community? Let us know what you think by posting your comment below. Allow Natural Death, AND, dnr, Do Not Resuscitate. Bookmark. What a helpful resource, AND is a very refreshing term to use especially when you reflect upon “natural death”. Noted there is a lot of work to be done before it is widely used vs DNR and for now, it sounds safer to stick to the conventional term that emergency respondents understand.